Internet Protocol Television (IPTV) is a system which delivers television services via internet protocol over a packet switched network ie the internet as opposed to the traditional forms of transmission such as terrrestrial, satellite or cable. A definition of IPTV approved by the ITU is "IPTV is defined as multimedia services such as television/video/audio/text/graphics/data delivered over IP based networks managed to provide the required level of quality of service and experience, security, interactivity and reliability"
IPTV is distinguished differently from Internet TV by its on going standardisation process. IPTV systems link content providers (such as TV networks) to consumers. An IPTV system can transfer digital content (i.e.TV programs) through IP data networks (the Internet) to devices that can receive and display IP digital video (i.e.standard television sets that have a set top box). IPTV content sources can range from live TV networks (CNN) to niche on-demand content from micro-producers. IPTV systems can deliver an unlimited number of channels as each television set only requires one TV channel connection which can be linked to any other TV source the IPTV operator can provide. IPTV Service Providers - IPTV service providers obtain the rights to transmit media programming to their customers. 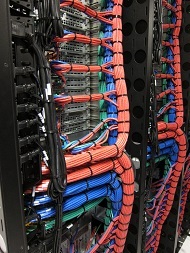 While IPTV service providers may focus on providing TV services in specific geographical areas (such as where they own or control TV distribution rights), IPTV service providers can technically provide programming to anywhere in the world where they can reach customers through a broadband data connection. 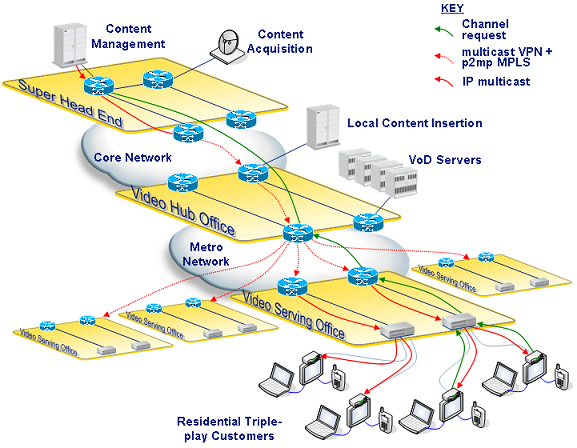 IP Distribution Systems - IP distribution systems transfer media programs from the content sources to viewing devices. There are many types of systems that can distribute IP data packets which include telecom, wireless, cable TV, power companies (data over power line), and competitive access providers (i.e. the new optical networks). IPTV Viewing Devices - IPTV viewing devices can receive media in IP form and convert it into media that can be viewed by the user. IP viewing devices range from standard televisions that use IP set top boxes to convert IP video signals into a format that can be viewed on a standard television to mobile telephones with digital video viewing capabilities.